Twelve students from Leeds College of Building visited Wrexham Mineral Cables in North Wales on 21st January. The group were taken given a tour to show how the cable is manufactured at its modern 5000 m2 production facility. They were also shown the quality checks and tests carried out at each stage. 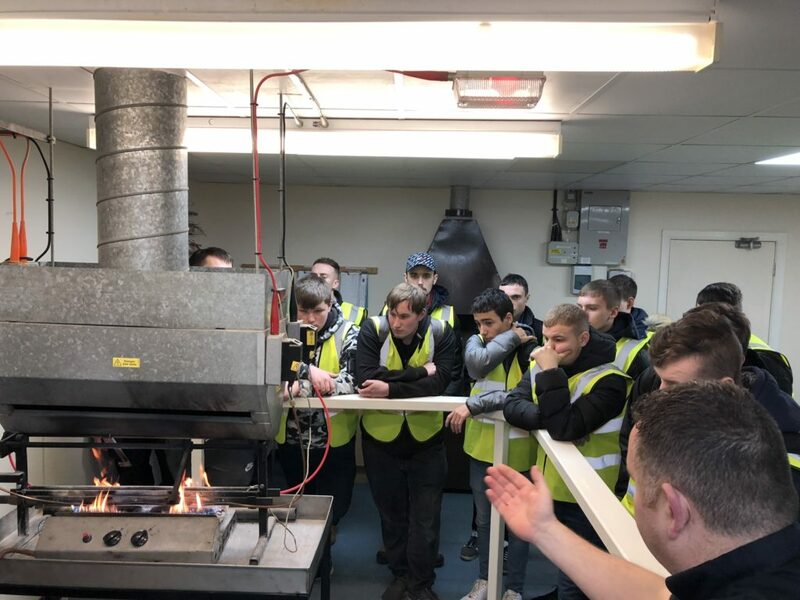 At the end of the tour the students were then taken to the in-house test laboratory and given a live demonstrations of realistic fire conditions and typical smoke tests and how these impact on different types of cable. Under fire conditions mineral insulated cable is proven to last far longer than polymeric, or plastic-coated, cabling. Lesser cable systems such as polymeric cable tends to fail much quicker than mineral, causing safety-critical systems to shut down. After the successful visit and interest from more students, Jake Hardcastle form Leeds College of Building has s organised a further visit in March. Jake said: “Visiting Wrexham Mineral Cable was really interesting. It gave the students the chance to see what the manufacturing process is, what materials are involved and how the cables tested. It was especially interesting to see the live fire test rigs under realistic conditions and how these compared to other products”.